In celiac disease, the immune system recognizes gluten as a foreign substance and produces elevated levels of antibodies to get rid of it. Blood test – A blood test, also referred to as an IgE test, measures your immune system’s response to gluten by counting the number of specific antibodies in your blood. Biopsy – If certain antibody levels are high, a biopsy, or tissue sample, is taken from the small intestine to determine the extent of or absence of tissue damage in order to confirm a diagnosis. If you suspect that you or a loved one may have celiac disease or gluten sensitivity it is necessary to undergo testing before starting a gluten free diet regimen for the test results to be accurate. Testing may produce a "false negative" result if a gluten-free diet is followed before testing occurs. Store all gluten-free products in separate labeled containers and away from gluten-containing foods in the refrigerator and pantry. Buy squeeze bottles of condiments like ketchup, mustard and relish. Use labeled utensils and cutting boards that are for preparation of gluten-free foods only. Use a separate toaster or a toaster oven where the rack can be removed and thoroughly washed between uses. Make sure kitchen surfaces, cooking equipment and utensils are washed thoroughly between uses. Be aware that fried foods may have been cooked in the same oil as battered with gluten-containing ingredients have been fried. Request that the grill be cleaned preparation of your meal when dining out and keep the meal away from meals that may contain gluten. At a buffet or salad bar, request a clean spoon prior to use. When purchasing deli meats, request that the slicer be thoroughly cleaned and sanitized before fulfilling your order. You may also consider shopping early so your deli order is the first of the day. Shopping: It is extremely important to carefully read labels while shopping. If a package bears the "gluten-free," claim, the manufacturer has tested the product to ensure the ingredients meet the FDA’s criteria in order to voluntarily make this statement. Keep in mind that food products may have traces of gluten if it is produced in a facility that also produces gluten-containing foods. If a food does not have a "gluten-free" claim on the package, check directly with product manufacturers for more information. Ingredients and manufacturing and plant conditions can change frequently so make label reading a habit. Eating Out: When dining out, ask detailed questions about ingredients and how the food was prepared – your health and safety are at stake! 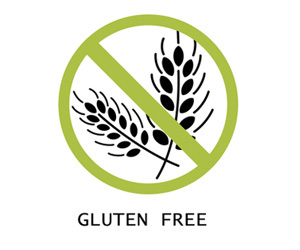 Fortunately many restaurants are now offering gluten free selections that are either marked as such on the menu or on the restaurant’s website. You may also consider calling ahead in order to evaluate menu options or alert the chef of your dietary needs. A new diagnosis can be scary. Be sure to build a support system of family, friends and healthcare professionals to help you manage your diagnosis of celiac disease. Talk to a doctor or registered dietitian when eliminating foods from your diet about possible vitamin and mineral deficiencies. They may recommend an adjustment in your meal plan or a supplement to replace nutrients lost by eliminating the offending food and food ingredients. Vitamin and Mineral Supplementation Gluten-free diets may be lacking essential nutrients like folate, thiamin, niacin, riboflavin, iron, calcium and fiber. When coupled with poor nutrient absorption, supplementing your diet with a daily multivitamin is generally necessary to prevent malnutrition. Discuss all supplements with your doctor or registered dietitian to determine which one is right for you. Remember to read the label thoroughly before purchasing dietary supplements as some may use fillers that have been made from wheat or rye. Medications Talk to your doctor about all medications prior to use as some may use fillers that have been made from wheat or rye.